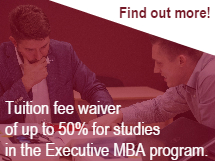 The Mentoring Program (MP) of Riga Business School represents a bridge between Faculty and students. Mentors gain personal satisfaction, feedback and networking opportunities. Mentees obtain advice, feedback and an expanded base of skills, knowledge and networking opportunities. The mentor-mentee relationship is designed to foster maximum productivity and commitment to the RBS platform through encouraging stong relationships, training, support and recognition of accomplishments.